Still in his twenties, Salt Lake City resident Ernesto Edwards made several trips to San Francisco and found his passion. In the city’s Mission District, the Berkeley Renaissance, one of the most vibrant offshoots of the Beat Movement, was gaining creative speed. Edwards, who had studied architecture at The University of Utah, met Robert Duncan, a poet whose work only recently has regained major interest, and many other writers and artists. 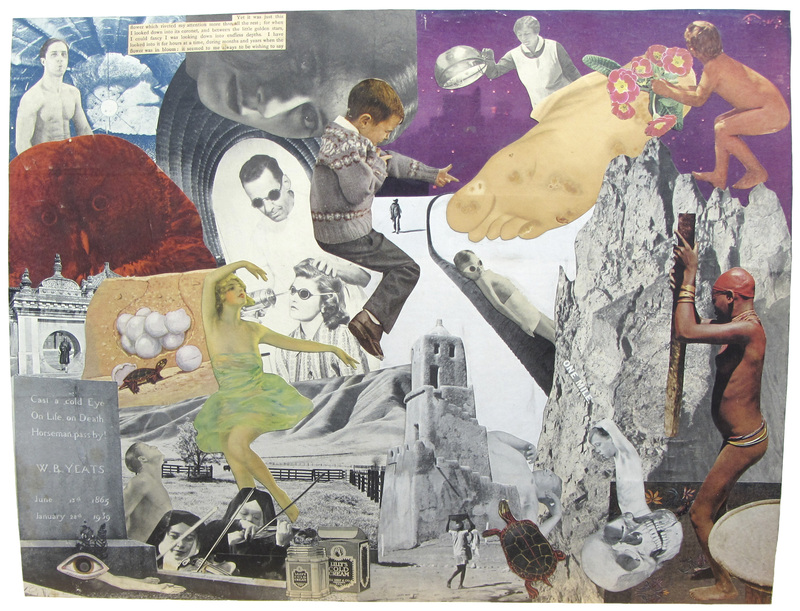 However, an exhibition at the San Francisco Museum of Art had drawn Edwards’ greatest interest toward the work of Jess (who had long before changed his name from Burgess Collins), an artist then in his late 30s whose paste-ups and collages were highly praised and recognized. An inspired Edwards returned briefly to SLC and then packed up his belongings to move to the Bay Area. 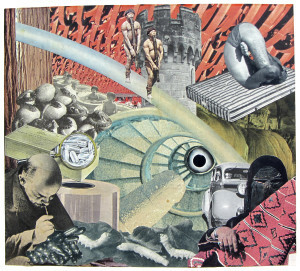 While he wrote poetry which drew mixed reactions within the circle of writers and artists who interacted with Duncan and Jess, Edwards began to cut up magazines and “anything with pictures in it” to create his own collages – nearly 100 in total within a relatively short span in the 1960s. They echoed Jess’ proclivities for myth, avant-garde, vintage images, and an approach that was inflected with fresh reminders of Pieter Brueghel and Hieronymus Bosch. Recently, the fruits of the Berkeley Renaissance have become highly visible in a rapidly growing stream of new book releases and gallery shows, most notably an award-winning traveling exhibition, organized by Sacramento’s Crocker Art Museum. 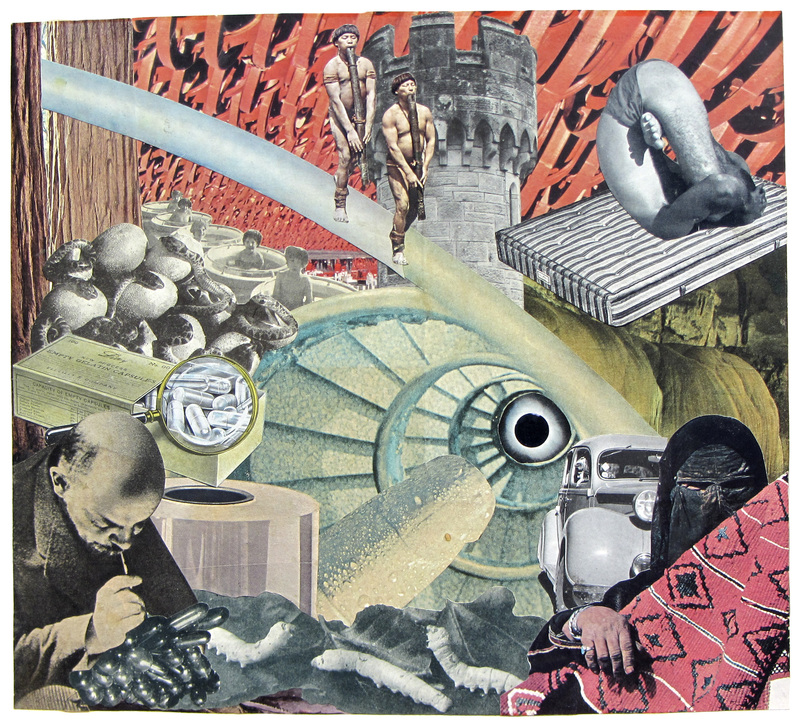 On May 16 at 6:30 p.m., as part of the May Gallery Stroll in downtown Salt Lake City, the Ken Sanders Rare Books shop will open an exhibition of Edwards’ collages, which includes 12 works produced during the 1960s along with a pen on paper portrait of Edwards by William McNeill. 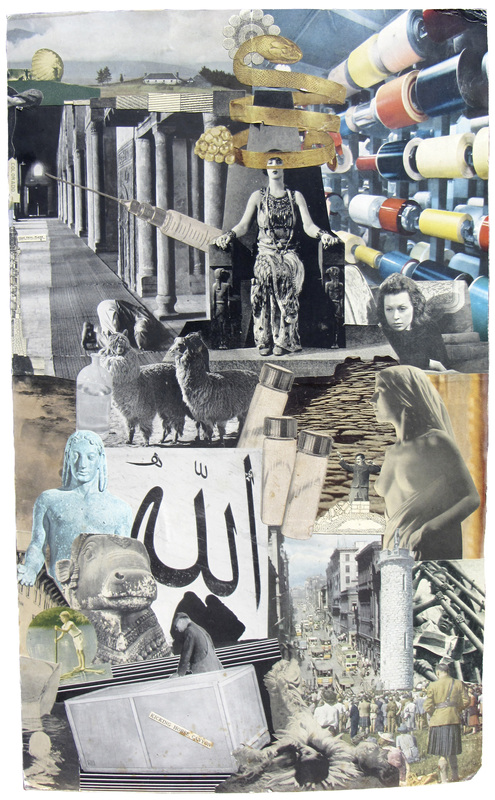 All of the works will be available for sale during the exhibition, which runs through June 18. The exhibition is notable on several levels. Four other pieces by Edwards, including one of his earliest works as well as one comprising six panels, are part of the national show ‘An Opening of the Field: Jess, Robert Duncan, and Their Circle,’ which will have stops in New York City and Washington D.C. before returning to California. The show recently received a Best Show award for excellence from the International Association of Art Critics-USA. Likewise, the pieces being featured in the Salt Lake City show strongly exemplify what Wagstaff and Michael Duncan, another guest curator for the Crocker Art Museum show, say defines Edwards’ art. The collages “share Jess’ penchant for humor, mythological references, and incorporation of absurdist texts,” as he “mixed images of male nudes in a maelstrom of cutout religious symbols, animals and politicians.” As indicated in the first-rate catalog which accompanies the national exhibition, Edwards worked with enormous amounts of materials for his collages, carrying boxes of magazines with him whenever he moved. And, as he mentioned in an interview with Wagstaff for the catalogue, he wasn’t the “least bit intellectual” in his approach to creating his art. 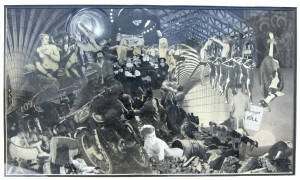 In the 1960s, his work, most of which is now in private collections, was first featured in San Francisco’s Buzz Gallery, one of the most important early venues for Bay Area artists. He also was featured in various in-home exhibitions as well as the Mostly Flowers gallery in a downtown airport bus terminal in San Francisco. The pieces range in size from 9 inches x 15 inches (‘Who Knows Which Who Cares’) to 32 inches by 18 inches (‘The Original Sin’). The works cumulatively reveal an incredibly deft hand of synthesized composition, remarkably so as they pull together many seemingly disparate elements. Simply put, Edwards was as natural as possible in the collage art form, keenly representing his own experiences in the countless interactions he had during the Berkeley Renaissance. Empty Gelatin Capsules, June 1967, Ernesto Edwards. Edwards, now in his early 80s, is preparing to move to Kashmir. During the decades he lived in San Francisco, he became an active patron collecting works of art using the money he earned from a middle management level position at San Francisco General Hospital. As many of the artists have already died – including Jess in 2004 and Duncan in 1988 – Edwards has proven to be an indispensable resource. Kathy Schockmel, art book room curator at Utah State, says many of the materials have major scholarly value. These include a VHS copy of the film ‘Daydream of Darkness,’ made by Helen Adam and the painter William McNeill in 1962-3 and is considered a legendary experimental work, as Schockmel explains, “a ‘poetic film fantasia.’” She adds, “It was shown only once, at Robin Blaser’s Peacock Gallery on the evening of JFK’s assassination, and then abandoned. The film was thought lost until Edwards located the original celluloid film and gave it to Kristin Prevallet, author of the Helen Adam Reader who arranged for its restoration and provided this copy for Mr. Edwards.” The bonus archival bit, according to Schockmel, is the 11-page typed shooting script for the film. Capricorn, June 1967, Ernesto Edwards. Edwards also donated manuscripts which were typed on onionskin paper or hand-written on lined sheets torn from a wirebound notebook. “There are some wonderful materials produced to commemorate social occasions – such as Joanne Kyger’s delightful “Dinner at Ernie’s in Honor of Paul’s Painting …” printed by hand and ‘decorated’ with a felt tip pen; listing party guests and “utterances,” as well as some sample invitations created by Mr. Edwards,” Schockmel explains. 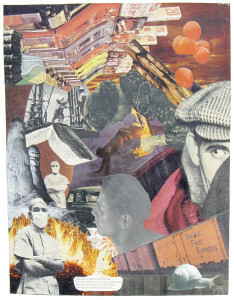 The collection includes many materials spanning more than three decades up until when Edwards returned to SLC in the 2000s after his mother died. These materials, “along with numerous gallery, theatre, and symposium flyers, post cards, and invitations chronicle a community of artists and writers living in San Francisco’s rich arts community,” Schockmel adds. There are additional significant archival materials for art historians and scholars. “As executor of Black Mountain trained artist, Tom Field, the archive of Mr. Edwards’ working materials for the 1996 Exhibition at 871 Fine Art’s exhibition, Tom Field: Paintings from Black Mountain College and the Beat Era, is instructive,” she says. 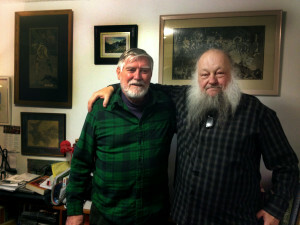 Edwards has donated every small detail expected in exhibition preparation of Field’s work, “including photos, slides of the artist and his paintings along with background materials including essays from Robin Blaser and Bill Berkson on Field.” The archives include a transcript of an interview between Tom Field and Kevin Killian, which was conducted at Edwards’ home in the late 1970s. Interest has flourished for learning more about the work of the Berkeley Renaissance. While the national exhibition has restored a widespread prominence that Jess enjoyed during his life, Wagstaff and Michael Duncan’s catalogue has extensively documented the work of Edwards and other artists who previously had received little attention, even among art critics. Similarly, Robert Duncan’s works also have enjoyed a fresh wave of visibility. The University of California has published his collected writings in four volumes. Wagstaff’s ‘A Poet’s Mind: Collected Interviews with Robert Duncan, 1960-1985’ received the 2013 PEN/USA Literary Award. Lisa Jarnot’s biography titled ‘Robert Duncan, The Ambassador from Venus’ is considered a definitive treatment. The Crocker show also has brought tremendous interest in Duncan’s work. 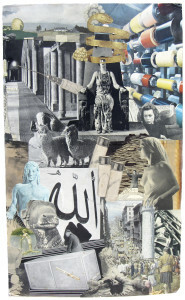 In Jess’ work, as described by Wagstaff, “collages became intricate fields of clotted and amalgamated images that convey what he called ‘a network of stories.’” Wagstaff added, “they are visual translations of fiction’s narrative spell.” Jess would collaborate with Duncan on projects such as the highly appraised ‘Scrapbook for Patricia Jordan,’ which is available online by the Archives of American Art.